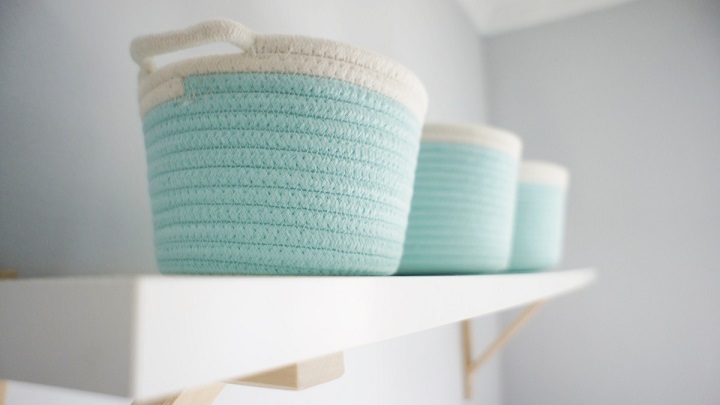 The baskets become a decorative element of the house. They fulfill their practical function as a storage system but go a step further and are, in themselves, an object with full personality. You can choose them from wicker, for example in their natural color or in another shade. 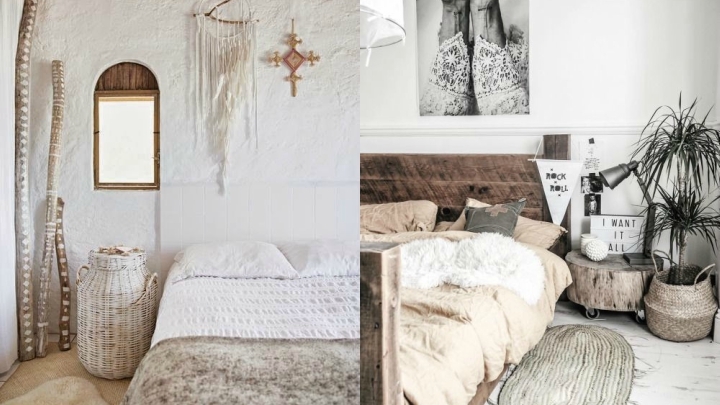 The wicker is a very natural material that provides a very cozy image where we use it. Next I tell you several ideas to use baskets to decorate. Attentive! As I said at the beginning, you can use them with their original color or also make them with others that have a special tonality that combines with the decoration and style of your house. For example, I teach, these baskets of turquoise that you find in Daui Home. They have a square or round shape and by themselves are very decorative. And inside you can save what you like most. Aesthetics and functionality of the hand. Another way to use the baskets in the decoration is to turn them into decorative pots. 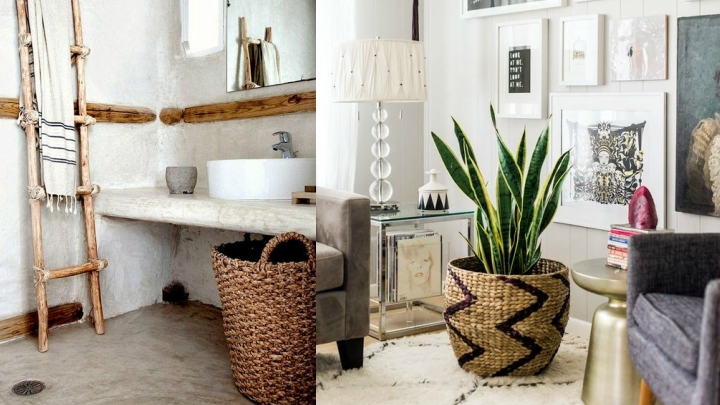 Personally it is one of the alternatives that I like, since the combination of the green of the plant with the material of the basket is very harmonious and allows to design very cozy environments. Simply place the pot in one of the baskets and you will see the difference. They are especially beautiful if the plant is large, since visually they are much more striking. Ideal to place in a corner of the room, for example, or in the hall. Being made of natural materials are ideal for creating serene and very pleasant atmospheres . That’s why the bedroom feels so good. You can use them as bedside tables (and keep things inside too) or put them next to the bedside table as a vase as I mentioned before. These two examples illustrate what I tell you. Do not you think a chulada? Sometimes we do not know very well where to store certain utensils in the kitchen. 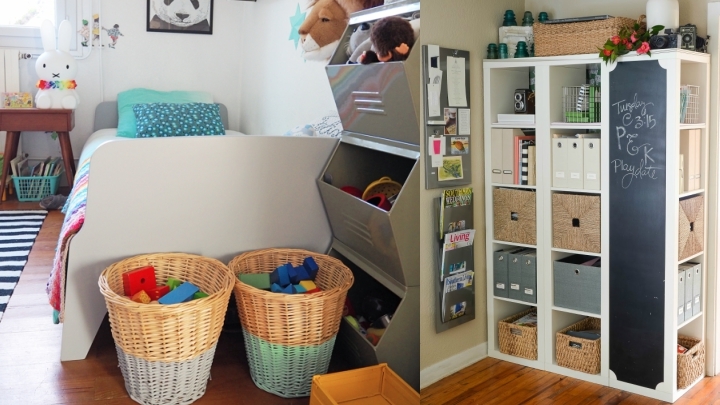 Place one or several baskets on a shelf and problem solved. In addition to take advantage of the space in vertical you will give an extra to the decoration of this room. A place in which the baskets also play a decorative and functional role is in the hall. You can put several under a bank, for example, and store umbrellas or any other object that is not too big. Square or larger in a corner, give a very nice touch to this area of ​​the house. They already indicate that we are in a very nice house. You have already seen several proposals. Now, tell me, which one do you like the most? Do you have a favorite?